Queues is a kind of abstract data type where items are inserted one end (rear end) known as enqueue operation and deteted from the other end(front end) known as dequeue operation. 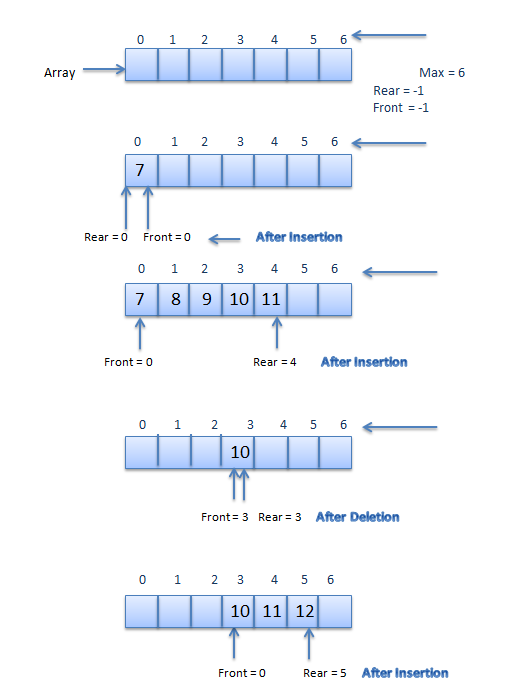 The queue performs the function of a buffer. initialize() Initializes a queue by adding the value of rear and font to -1.
enqueue() Insert an element at the rear end of the queue. dequeue() Deletes the front element and return the same. empty() It returns true(1) if the queue is empty and return false(0) if the queue is not empty. full() It returns true(1) if the queue is full and return false(0) if the queue is not full. Queues are mostly used in operating systems. Waiting for a particular event to occur.